This year’s event is sold out! The Coalition for Algoma Passenger Trains invites you to the 96th Anniversary of the Group of Seven painting on the Algoma Central Railway and the 82nd birthday of Glenn Gould, pianist extraordinaire and devotee of Lake Superior and the Algoma Highlands. The magnificence of the Algoma Highlands clad in autumn slendour, the rugged northern coastline of Lake Superior, wild rivers descending out of the Highlands and into the great lake – these have been inspiring many, including the painters of the Group of Seven and Canada’s internationally acclaimed pianist, Glenn Gould. Join the Group of Seven & Glenn Gould Train Event 2014 and learn, through experience, why and how the North Country so moved these men. The Event will begin on the evening of Friday, September 19th with a reception and presentation on this year’s featured artist, Alexander Young Jackson, and Glenn Gould with their Algoma experiences. The Art Gallery of Algoma will host the reception. On September 20th, Group One participants will board the Algoma Central Railway (ACR) in Sault Ste. Marie and ride north to Hawk Junction (Wawa) on the same rails that took members of the Group to their various painting sites along the ACR. The train trip will include a live commentary on the Group’s painting sites visible from the train. Michael Burch, art historian and researcher, will conduct the tour. At Hawk Junction, Group One will leave the train and proceed by bus into Wawa to the Wawa Motor Inn, Glenn Gould’s former lodging. In the evening guests will be joined by Group Two participants to enjoy an excellent dinner at the Wawa Motor Inn. Following the dinner there will be a presentation by musicologist, Dale Innes, on the role the north played in the music of Glenn Gould. Gould was a regular visitor to Wawa and the areas around Michipocoten. On the morning of the 21st, following the opportunity to participate in a workshop-demonstration or a coach tour of Wawa, Group One participants will trace Gould’s footsteps as they tour those haunts – waterfalls and shorelines – frequented by the pianist. In the afternoon of September 21st, Group One participants will travel down what has been called one of Canada’s finest road trips – the magnificent eastern coastline of Lake Superior – as the Event wends its way back to Sault Ste. Marie. Stops are made at lookouts and points of interest including Lake Superior Provincial Park and its comprehensive Visitor Centre. The Event draws to a close in the late afternoon. On September 20th Group Two will board a coach and travel north to Wawa along Lake Superior’s eastern coastline, stopping at Lake Superior Provincial Park and other points of interest. En route they will be introduced to – and experience – the sense of wonder that these northern lands inspired in the young Glenn Gould. Arriving in the Wawa area, Group Two participants will tour those haunts frequented by the pianist. Following the tour and checking in at the Wawa Motor Inn, participants from Group Two will join their Group One fellows for dinner and a presentation on the significance of the North Country on Glenn Gould’s music. The Group of Seven and Glenn Gould Train Event for 2014 is sold out!!!!! Ticket includes train and coach transportation to and from Wawa, accommodation in Wawa, lunch and dinner on September 21, breakfast and lunch on September 22, and all presentations, tours, choice of art sessions or Wawa tour, and reception. The ticket price includes a $18.00 cancellation fee to be applied if the train event does not occur for any reason. 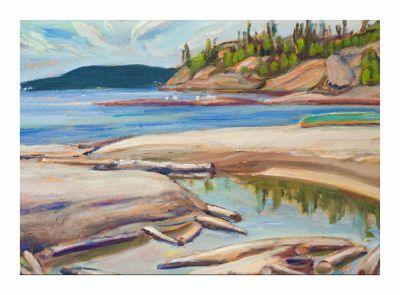 Come celebrate the 96th anniversary of the Group of Seven painting along the Algoma Central railway!